Overflow ball mill can be used for grinding various mine and other materials, which has been widely applied for various national economy departments, such as mineral processing, building and chemical industry, etc. Overflow ball mill has a series of merits, such as comparatively simple structure, no grid, high grinding fineness, comparatively less ball loading quantity and so on, widely used into the second stage fine grinding or other occasions requiring finer products. Its simple structure and easy maintenance makes it popular use in fine grinding. When the discharging granularity of mineral processing is 48-65mesh, grate ball mill is usually used; while overflow ball mill is better choice for 150-200mesh. The resistance of mineral pulp is small when steel ball falls. Therefore, mineral grinding at first stage always uses the grate ball mill. 1. Saving energy: With the matching between driver and grinding energy consumption, the energy can be saved greatly. 2. High grinding efficiency and good lining plate quality. 3. 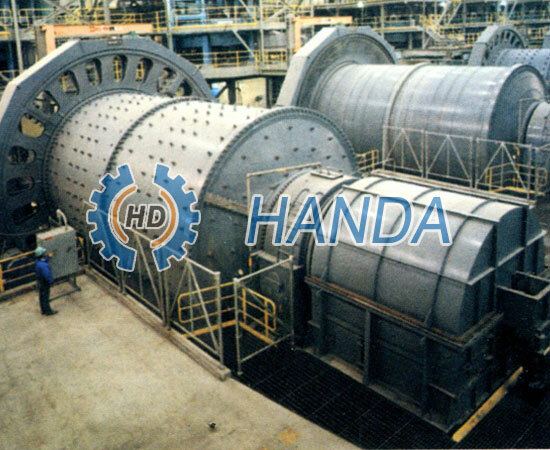 Using closed system to reduce the dust; Ball mill and grader can form a closed system with negative pressure transporting and without dust, decreasing the harm to human body. 4. Flexible design for discharging part. 5. Rotation part: All rotation part, including the drum, lining plate, medium, parting board and discharging grid plate, adopts high quality component to assemble. 6. Feeding part with large charging rate: The reasonable feeding port design increases the feeding rate.